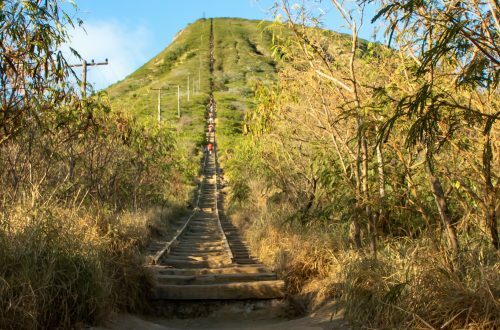 Most people who visit Oahu know about the Makapu’u Lighthouse hike or at least get a glimpse of it when they explore the island; the steep paved hike up to the pretty red lighthouse across from Sea Life Park, tucked between Hawaii Kai and Wiamanalo. 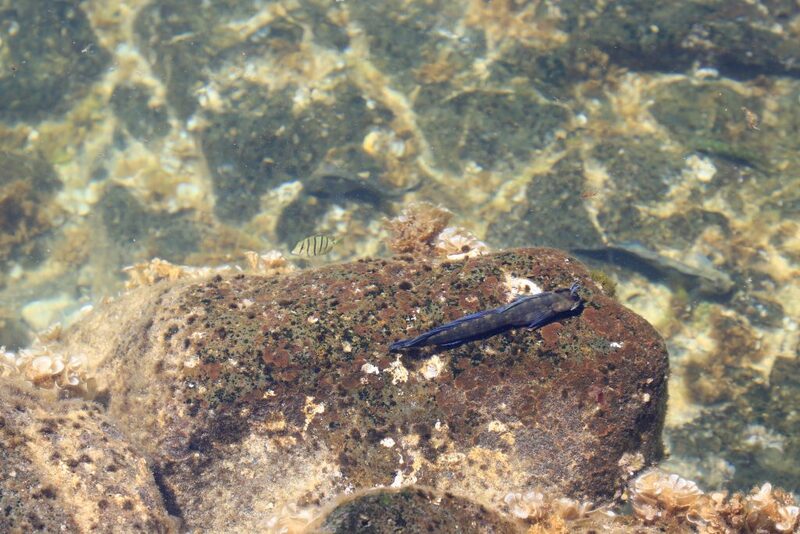 However, what many visitors to Oahu don’t realize is that right off this popular hike are gorgeous tide pools, deep enough to swim in and filled with sea life to explore. I have been to the tide pools before, two or three times since I first read about them and every time I ventured down the hillside I am amazed by the beauty of the pools. I am amazed by the beauty of the pools and have always wanted to go for a swim in them, but for some reason, I have never done it. Nerves. Self-conscious. Large crowds. 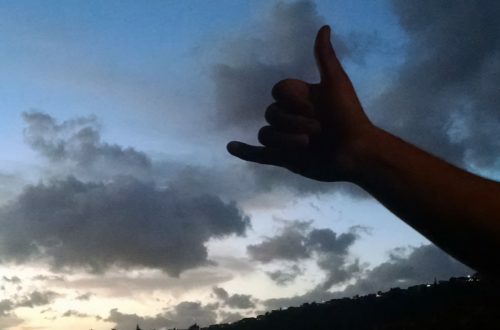 Whatever the reason I have never done it but promised myself I would before I left Oahu. 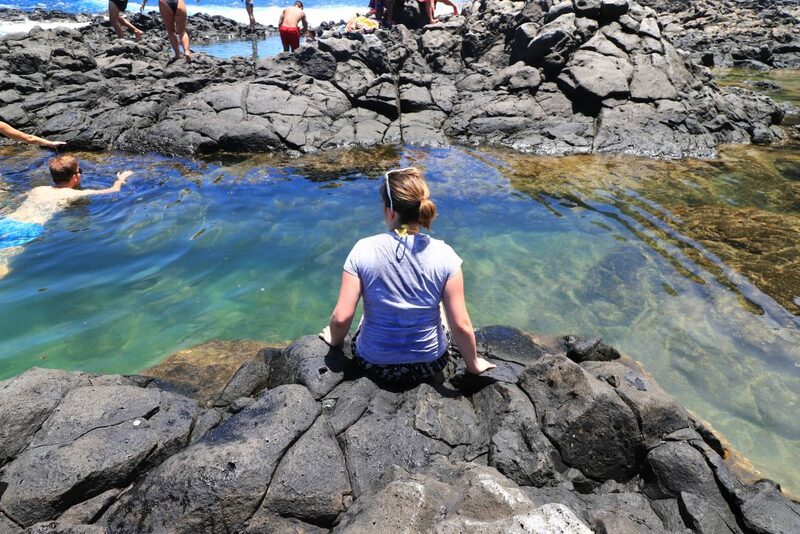 Sitting at the edge of one of the Makapu’u Tide Pools. This month I got to do just that and best of all I got to cross that item off my Hawaii Bucket List with two of my nephews! Two of my nephews finally came out to visit me this month and on their third day here we hiked them down to the Makapu’u Tide Pools and I swam in the pools for the first time. To get to the Makapu’u Tide Pool you take the Makapu’u Lighthouse Trail up until the third lookout point, the lookout point which has the signs with the details on whales. 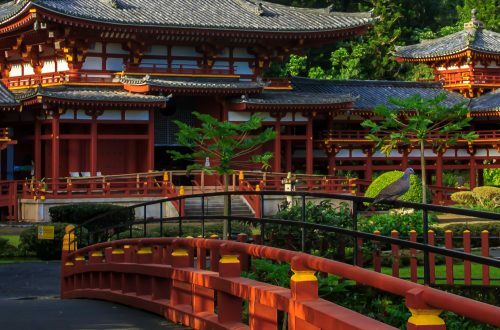 Here you abandon your nicely paved trail for a steep trek down the hillside. For experienced hikers, this trek shouldn’t be too difficult, however going down the trail is relatively unmarked (on your way back up white arrows will help guide the way) and there is lots of loose rock and gravel. 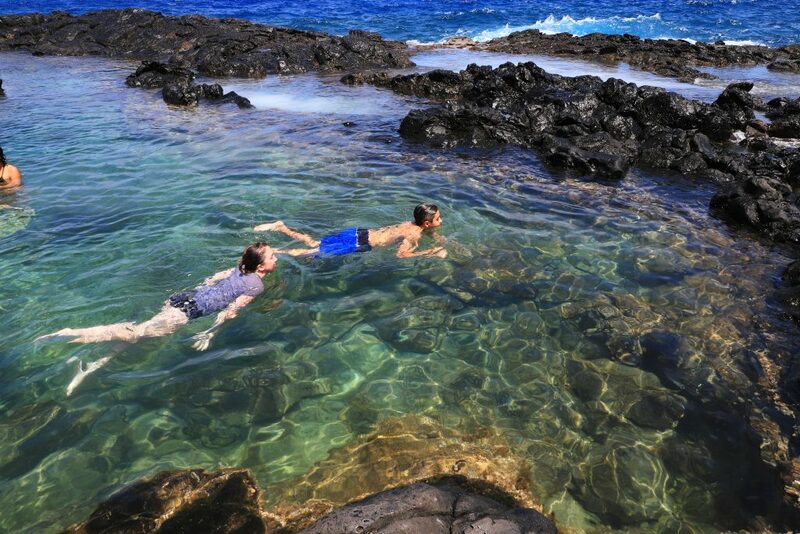 Swimming with my nephew in one of the Makapu’u Tide Pools. I have seen people do this hike in sandals and water shoes, but I highly recommend hiking shoes or at least sturdy tennis shoes. The terrain can be very unstable. Also, be sure to bring lots of water and sunscreen! Both the paved portion and the hillside trek of this hike is not shaded, meaning if you hike at my slow pace for this hike you will have the sun beating down on you for a good hour or so (one way). Once to the tide pools you can explore all the different sea life inhabiting the pools as well as take a dip in the deeper pools, as long as the surf isn’t too rough and the pools have been cleared out recently. Timing really is everything with this hike. Crashing waves and high tide help filter out the water in the pools, keeping them bright blue and clear. If a tide pool has not been flushed with fresh water recently and appears cloudy, skip the swim for the day. At the same time, I don’t recommend doing this hike if the surf is rough that day. Although this helps clear the pools, large waves can crash onto the tide pools and can injure or potentially do even worse to those visiting the area. Even on calm days be sure to keep an eye on the surf and the waves as a sudden large swell could arise without warning. Despite the hurricane watch, Hawaii had been on prior to my nephews’ visit, the weather was surprisingly perfect for our tide pool adventures. The ocean was relatively calm while we were down at the pools and all the rain storm surges had left most of the deeper pools crystal clear and perfect for an afternoon swim. Besides the unique opportunity to swim in tide pools, my nephews also had a chance to check out all the different fish and other sea life throughout the tide pools. *This hike, as well as swimming in the tide pools, can be very dangerous. People have been injured and even killed on this hike. Visitors exploring and swimming in the pools have been swept off the rocks and into the ocean. I do not recommend this hike if you are new to hiking or not confident in your abilities. If you do decide to attempt this hike always be aware of your surroundings, alert to what the ocean is doing, and never turn your back on the water!